AAA State of Play Blog: Recycled Plastic Park Equipment? Say you are looking for a few park benches and picnic tables to put in your park. There are many products to choose from and you keep weighing the pros and cons of every one. Maybe you like the style of one and the color of another, or the designs just don't match what you currently have. Look no farther than the recycled plastic products from Jayhawk Plastics. Jayhawk Plastics is the manufacturer of some of our most popular products when it comes to park equipment. 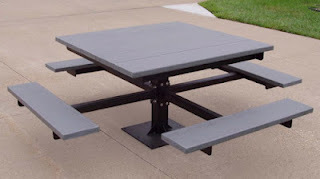 From trash receptacles to bike racks, from picnic tables to benches, Jayhawk Plastics provides a large variety of products that will match any of your existing equipment. By using a recycled plastic item you are also helping out the environment. You are also providing a unique element to your park! Be sure to head over to our Jayhawk Plastics section and see why recycled plastic park equipment is a good choice for you. How to select Backyard Playground Equipment?